Are you considering kitchen remodeling in Lake Forest CA? This is not a job for just any handyman or contractor. You need a kitchen design specialist such as Cabinet Magic. At Cabinet Magic, we have over 30 years of experience in cabinet fabrication and remodeling. We know exactly how to get you the high quality products you need and manage all the moving pieces of the project so that the work gets done on time, on budget, and with superior quality craftsmanship. 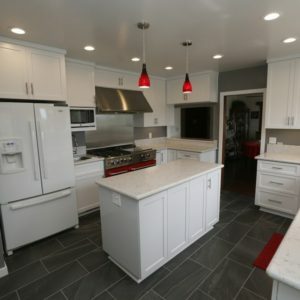 Totally changing the appearance and possibly even the layout of your kitchen with kitchen remodeling in Lake Forest CA can be an exciting prospect. But it can also be a bit intimidating. What if the finished design doesn’t turn out like you expected? At Cabinet Magic, we never want our clients to feel worried that they’ll be anything less than thrilled with their kitchen remodeling in Lake Forest CA. That’s why we use computer rendering software to create detailed 3D images showing what the finished remodel will look like. We’re happy to create multiple versions of the design so you can easily compare different options. We never begin work without your sign off and approval of every detail of the design. In most kitchens, cabinetry is a major feature and must be considered carefully as a design element. At Cabinet Magic, we can create the exact cabinets you want right here in our La Habra CA factory. We employ talented craftsmen capable of working in any style to suit your interior design scheme. We offer a variety of different woods as well as a complete palette of designer colors. Our cabinets are sturdily built to stand the test of time and incorporate high end features like soft-close hidden hinges and smooth drawer slides that make them a pleasure to use. Are you ready to stop dreaming of kitchen remodeling in Lake Forest CA and start actually making it happen? Call Cabinet Magic at 800-828-4380 now and request your free in home consultation. We’ll be happy to share ideas and provide a free estimate for the project.